Athlete’s foot is a fungal infection on the foot, caused by fungus called dermatophytes. These fungi live on dead cells of the skin. Medical term for athlete’s foot is Tines pedis. This infection occurs mainly between the toe fingers. It is a contagious skin infection. This is one of the most common kinds of fungal infections experienced by people. This condition could occur to anyone, but people who wear their shoes or socks for long periods of time are usually more prone to it. Athletes, who perform hard physical training and tend to wear shoes and socks for long periods of time at a stretch, are more prone to athlete’s feet because they sweat a lot and the warm and moist conditions in the shoes is the perfect environment for the fungus to grow in. Itching between the toe fingers is the most common symptom of athlete’s foot. Since the fungus begins to grow between the toes of the infected person, the skin between the toes can get scaly and rough. This causes itching and sometimes even burning of the skin. After sometimes moist and white lesions develop between the toe fingers. These lesions can further complicate the condition of your feet, causing a lot of pain and discomfort, especially when you are wearing shoes and socks. There may be burning sensation, blisters and inflammation in addition to the other initial symptoms. There may be pungent smell from the toe as the infection continues to grow. 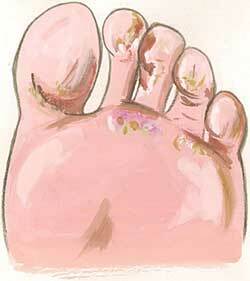 There may be redness and scales on the toe due to the growth of the fungus, the inflammation and the itching. The fungus from the foot often tends to spread to other parts of the feet, infecting the nails as well. If the nails get infected, they may become thick, yellow in color and may give out a bad odor. Some people may also develop a large rash on their foot, which doesn’t seem to go away despite a lot of treatment. If such a rash is present on your foot, consider seeing a doctor. Excessive inflammation, redness, oozing and fever are additional athlete’s foot symptoms that need treatment. Moist and damp conditions are suitable for the growth of the fungus causing athlete’s foot. They mostly occur on feet because shoes and commonly visited places like swimming pool, showers, bathrooms and so on provides the suitable environment for the fungus to grow. You can get infected by sharing socks or shoes with an infected person. Sometimes you may get infected through pets because they carry the fungus on their fur. A person suffering from athlete’s foot could pass the infection around because the fungal strains tend to be present in the shoes as well. A person wearing athlete’s foot shoes is far more likely to get infected than a person who is wearing clean shoes. The infection itself is very similar to other fungal infections such as the jock itch. Athletes’ footwear tend to have the fungal strains inside them, since they continue to wear the same shoes for long periods of time. It is primarily because of this reason that athletes are recommended not to share their shoes or socks with others. Athletic running shoes should ideally be aired after every use. Bright sunshine and air can help kill off the fungal strain naturally, leaving your shoes clean and free of any infection causing microbes. The growth of athlete’s foot fungus is usually kept in check till the skin is clean and dry. When the body becomes sweaty and the skin is unclean, the fungus quickly begins to multiply, causing the condition to spread from a single spot to the whole foot and sometimes even the nails. Prepare a solution of water and white vinegar – one part of white vinegar to four part of water; soak your feet for 20 to 30 minutes twice day. Sprinkle some baking soda between your toe fingers and rinse your feet after fifteen minutes. It is as effective as an expensive antifungal powder. Rub tea tree oil between your toe fingers, it has antifungal properties. For immediate relief from itching or burning, soak your feet in an antiseptic mouthwash like Listerine. Corn starch is effective in soaking moisture, so keep your toe fingers dry by sprinkling some corn starch on them. Apple cider vinegar is one of the best athlete’s foot treatment home remedies. Dilute a cup of apple cider vinegar with an equal amount of water. Use this diluted solution to wash the affected skin. Apple cider vinegar is acidic in nature and can easily help kill off the fungal strains that cause the infection. In more severe cases, undiluted apple cider vinegar may be used for athlete’s foot treatment. Betadine is another effective athlete’s foot treatment. Fill a basin with one quart of water and add two spoons of betadine in the basin. Soak your feet in the warm water and betadine solution to get rid of any microbes in your feet. This also helps prevent bacterial infections from spreading in your feet and making you sick. Athlete’s foot treatment can be done through over the counter medications as well. If you have blisters as athlete’s foot symptoms, you can use over the counter medications for athlete’s foot relief. Though these medications can help you, athlete’s foot treatment during pregnancy using these medications should be avoided at all costs. These treatments should only be taken up on the recommendations of your doctor. Athlete’s foot treatment for kids using these medications should also only be done if the doctor recommends it. Avoid eating baked products and products that have high yeast content in them. Avoid alcohol, sugar, cola drinks and grains. Eat a healthy and a balanced diet, avoid processed foods. Your diet must include fresh fruits and green leafy vegetables. Avoid fried and greasy food. Garlic has a good antifungal property, eat raw garlic or include it in your diet. • Natural fiber footwear should be used. • Always keep your feet dry. After you have taken a bath, use your towel to dry your feet thoroughly, especially between the toes. If you are already feeling a little itchy in your toes, avoid using a towel or any other kind of cloth between your toes. In such a case, use a hair dryer to dry your feet rather than towels. • Use some antiperspirant to keep your toe fingers dry, but if you have any kind of skin irritations between your toes or on the skin of your feet, do not use any chemicals on it, not even an antiperspirant. Use antifungal powder rather than antifungal cream as it has a greater reach, and it can easily reach between the folds of your skin, allowing the infection heal faster. • Use cotton socks on dried feet. Cotton socks allow air to pass through and are more absorbent when it comes to sweaty feet. However, even if you wear cotton socks, make sure that you air your feet periodically and never wear dirty socks for too long. • Clean your shoes from inside using a paper or a cotton cloth. Shoes tend to have foam or fiber in their lining and should be washed from time to time to keep them clean and free of any kinds of germs and other microbes that may affect them. Use only natural fiber footwear. Use mild soaps and avoid deodorant soap. • If you are prone to sweating a lot in your feet, try wearing open toed shoes or sandals most of the time. This can keep your toes aired and greatly reduce the risk of developing any kind of infections in your feet. You may use an athlete’s foot treatment home remedy, but the easiest way to treat this fungal infection is by keeping your feet dry and by preventing the infection from occurring in the first place. • If you get infected, try and keep your feel clean. Also, persistence in the athlete’s foot treatment is extremely important as this is the only way you will get cured of your problem. Choose your shoes with a great care and do not wear them for too long. If you are an athlete, avoid spending too much of time in locker rooms and other areas where you are exposed to fungus and other similar kinds of infection causing microbes.